Barei (Bárbara Reyzábal González-Aller) was born in Madrid on 28 March 1982. Barei is the singer-songwriter whose sound is influenced by Michael Jackson, Tina Turner, Stevie Wonder, Aretha Franklin, funk of James Brown, synthesized pop influences such as Katy Perry, Rihanna, Madonna, and Bruno Mars. Barei is always willing to break barriers and considered that the key to a full career. Now she already has two albums on the market, Billete para no volver and Throw The Dice, and a music career spanning over 16 years based on American pop, soul and black music. She has an energetic and direct style, trying to cause a commotion on the listeners. Barei has also penned songs for other Spanish artists such as Malu and Edurne, or the Japanese singer J. May and has also done some music works for television. Barei describes herself as natural, charismatic and full of energy. 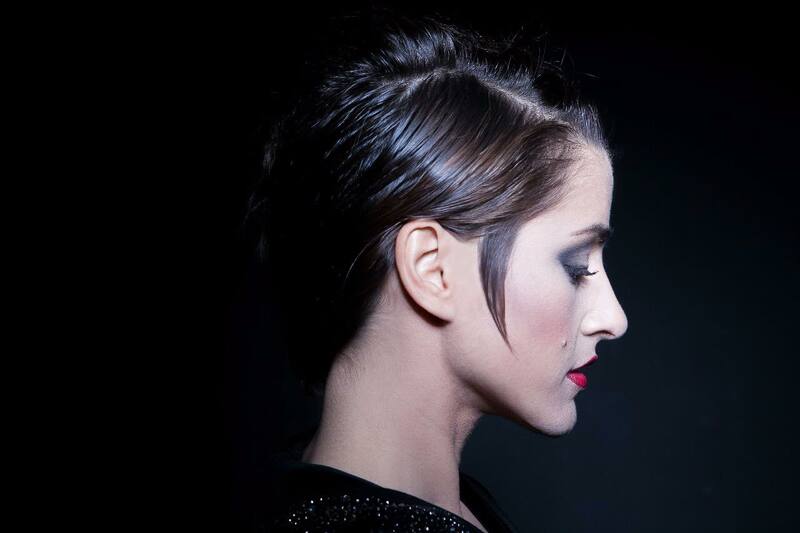 Barei, who has studied music theory, singing, guitar, piano and participated at the age of 18 in the Benidorm Festival before travelling to Miami, where she began to compose her demos. It was 10 years ago in Miami, where the artist found the final impulse after a concert in one of the most popular attractions of Miami Beach when she decided to completely dedicate herself to writing, singing and sharing her life through letters and melodies with the world. In this attempt was born her debut album "Billete para no volver" (2011), an album full of songs about evolution, change, growth and the choice we all have to be who we want to be. On her return to Spain she performed in the main stages of Madrid. In 2012 singer has decided to settle on English language of performances, as most of her influences came from American and British pop, soul and funk and she felt most comfortable singing in English. Barei has started her English language career with "Single a Single" challenge, taking the firm decision to reach for her fans, honoring them with a new song every three months. With the release of each 'Single' cames a new music video that explained her transition as a woman and a singer, and aiming to become the soundtrack to the lives of its audience. First single "Play" reached the Top 5 of the best-selling pop songs on iTunes, and its music video got more than 150,000 views. The next challenge for Barei was not to achieve the fame, but to get remembered. Second single "Another's Life" was same successful, reaching the Top 30 on the iTunes list of the best selling songs, and it's video on YouTube was viewed by more than 600,000 times making the song one of the most important releases of the Spanish music scene. Next track released was "Foolish NaNa", reaching nearly 1 million views on Youtube. Adamant to keep her accomplice public in each of her steps, Barei decided to give her fans the opportunity to choose what they wish to hear, and with the launch of 3 demos on the social networks she asked to choose which would be the next 'Single' "Wildest Horses" was the song getting the best feedback - a song filled with questions of love and pain that the artist has dedicated to a member of her family who died of cancer. The video for the song reached over 1.5 million views. Next single: "You Fill Me Up (My Yang)" - a cry of love, put an end to the challenge and was the final link leading to the 2nd studio album "Throw The Dice" (April 2015), which reached the Top10 list of iTunes selling albums on the date of its release. Last year Barei performed at the Starlite Festival in Marbella. Barei won the Spanish national final with a song written by Ruben Villanueva and Victor Pua Vivó, which she describes as having "pop electronic base and a very modern sound, American pop, soul and black music influences, a song that everyone can relate to, that speaks of never giving up". Say Yay! has reached #1 on the iTunes Spain chart on three different occasions since its release back in January. "I compose in English and do a very international and current pop music, with lyrics that contain a clear message. In fact I think my next step to professional level should be out of Spain because my music fits better international stage. And Eurovision certainly can be a great opportunity for my career", says the singer. "I think that a key to the victory is to deliver a universal track, which can be played on radio anywhere in the world, as is "Heroes", winning song of Eurovision 2015, as well as tracks of Russian or Latvian entrants this year". "This is the biggest opportunity to cross borders and share my music with everyone in Europe. I love to meet different people and learn from every one. The Eurovision Song Contest also means discipline, hard work and self learning; it will make me grow professionally and personally"
Spanish representative Barei has attended Eurovision Song Contest preselection in Ukraine last Saturday and ESCKAZ got a chance to speak with her about preparations for the international show. As usual, we've started congratulating the performer with her achievement and "Objetivo Eurovisión" victory. "Thank you! I feel very excited and grateful. Now it's time to work hard to be at the height of it", Barei has responded. She tells us it wasn't her personal idea to apply for the Spanish preselection, but one of her team members sent her candidacy to RTVE and they liked her project. After a few days she was called informed that RTVE were thinking to include her name in the list of candidates to represent Spain in the competition. The next task was to get a perfect song. "Say Yay! was written specially for this chance. At first we've had two more possible songs to choose from but we decided to do a totally new one with all the ingredients to convince Europe in 3 minutes. It had to remain faithful to my style, it had to be catchy and easy to make people feel identified with it. "Say Yay!" is a powerful song full of energy and truth!" Barei says there still will be some small changes in the production, mix and some of the backing vocal arrangements of her track. "When something has been successful the way it is, you have to be careful with every little change on it... otherwise people can get confused with a very different version". She has no plans to do a Spanish version, as she thinks song will simply not work in Spanish language. The team is already working on getting a perfect staging for the Eurovision. "There will be something simple to add but nothing should divert attention of the most important thing: the song". 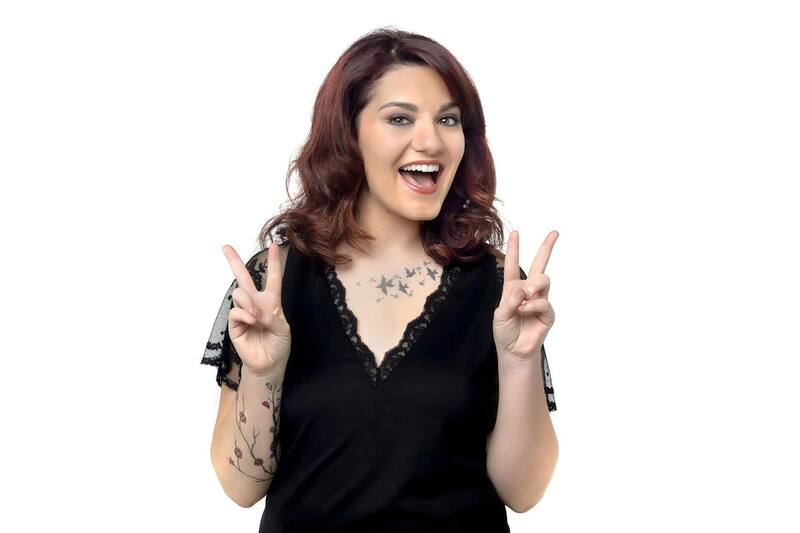 She reminds that her team is still accepting all proposals on the possible Eurovision staging, which should be sent to sayyay.sugerencias@gmail.com. Being asked about the outfit she will wear in Stockholm, the one thing she is sure of is that she won't wear high heels! The team is currently in touch with some fashion designers trying to define the most suitable options. "I need to dance and focus on my attitude. I want to feel comfortable and trustful on stage", she says. Asked about plans to make a music video for the song, Barei happily screams: "Yeaaaaaah! Of course! Good vibes! Dance and party! It will be a metaphor of "keep on trying" and not die trying". She again reminds about the chance for every fans to get featured in her music video, for more information, check here. Barei says she isn't looking for any particular result in the competition, but just wants to give her 100% and work hard to give the best of herself on the big night. The most difficult in Eurovision preparations is to be working 24 hours a day. "It is a NON STOP since the 1st of February", she notes. Besides performing in Ukraine, Barei also has plans to attend few Eurovision promotional events. "It would be a pleasure for me to continue promoting my music out of Spain. Probably I will be in Amsterdam, London and Moscow but I don't know it for sure yet". She has listened the most of the entries already chosen for competition and her favourite ones are Ireland with "Sunlight" and Belgium with "What's the pressure". One of our regular interview questions this year would be a favourite Swedish or Melodifestivalen entry, and Barei without any hesitation names "Heroes" by Mäns Zemerlöw - "I can't wait to meet him this year, hahaha!. Besides Eurovision singer is working on the reissue of her latest album "Throw the dice" that will include "Say Yay" and one or two more unpublished songs, that will be released this spring. Her message to the readers of the interview is "Never let anyone tell you what you can do or not. Freewill is all you need to be who you want to be. Thank you so much for your support and thousands of kisses!". Singer Barei has revealed details of her outfit for Stockholm. Her first idea was to have a long dress. But she tried it on at the rehearsal and saw that did not work, "I could not express myself fully, it could not be me, I felt tied" says Barei, who opted for something comfortable to dance in as well as sneakers, an element already associated with the singer. Eventually, she approached stylist of TVE and fashion designer Raúl Amor, who created several outfits - some more lighthearted, some more sophisticated - which Barei will wear at different events and performances in Stockholm. In the Eurovision final itself we will see a 100% Barei look, she says. She adds that she will wear something that will be associated with Rihanna or Swedish singer Loreen, but her style will have nothing to do with ones of Edurne, Ruth Lorenzo or Pastora Soler. "Those dresses are good for a ballad but not for the up-tempo", she explains. Spanish entrant Barei completes last rehearsals in Prado del Rey before travelling to the Swedish capital, but also this week will attend two major events. On Thursday she will be the guest of honour of the Swedish embassy in Madrid. Ambassador Cecilia Julin will host this evening, where Spanish representative at Eurovision will present special performance of "Say yay!". She will also share the stage with Swedish guitarist Gustav Lundgren and Scandinavian School choir. On Friday at 19:00 the Palacio de la Prensa of Madrid will become a real Euroclub. RTVE and Barei will held a Europarty in which the singer will offer an acoustic concert which will include not only 'Say yay!' but also other songs from her album 'Throw the dice', which has just reissued by Universal Music Spain. Tickets to attend can be collected on Thursday 28, from 16:00, at the desk of Palacio de la Prensa. In addition, ten lucky viewers will be able to meet Barei in person and share with her a few moments before her upcoming trip to Stockholm. Representative of Spain Barei joined those thinking that Russia should not organize Eurovision Song Contest. After attending Eurovision party in Moscow, singer tells that she has seen with her own eyes attitude of some of the locals and sexual orientation discrimination. "You know that there are many Eurofans who are very concerned that if Russia wins, they do not want to travel to Moscow next year for the fear of reprisals against homosexuals. At the end among those who vote are many Eurofans and 90% of them are homosexual. So if I were gay, watching how they treat gays, Russia would not get my vote. Because of the human issues...", said the singer in the interview to Lavanguardia. "I've been there and was in a shock when I've arrived. All because Hovi, the candidate of Israel, was treated very badly at the airport. Very badly... They laughed at him so huge that I was about to start a scandal. You know, he has a very androgynous appearance and make-up, painted eyes. We've arrived together from Riga. And when we got to the passport control, they broke the plastic of his passport and looked at him closely. They gathered around and started laughing between them... It was so horrible! I thought that could happen in Russia, but that it would happen already in the airport and will be so shocking... Then I have thought about all Eurofans saying "if Russia wins...". "That does not mean that the artist does not deserve it, but one thing is that and another is the winning country. However, I myself had no impressions of Russian entry. I remember seeing the video, and that Sergey seemed charming, but very cold. A lot of visual boast but the song when I heard, it left me untouched. Neither the melody nor the performer. I do not even remember it now. I remember stripes, rising ground, the girl trying to reach him... but I do not remember the song, or the message. That's what I call: overinformation"
"France has a great candidate. I like him very much. We have became friends easily, we together studied my dancing steps, and now he even recorded a cover version of Say Yay. I also like Cyprus, very good rock song. I really like Sweden, is a pretty ordinary track but you never get tired of it. I really like... (hesitates) Malta but it reminds me Running of Beyoncé. And... what else? I really like Finland, Belgium ... because they are more my style"
The singer also admitted she will never blame politics in the case of her failure: "I think it will be very difficult to win but you can not always blame everything on political factor. If I stay in 25th place or last, I assure you I will not blame the politics. I will say: "I have not done well." I can not blame TVE, nor politics, nor the surrounding countries. Only myself, absolutely. It's my own responsibility", says Spanish entrant. Read complete interview (in Spanish) here. 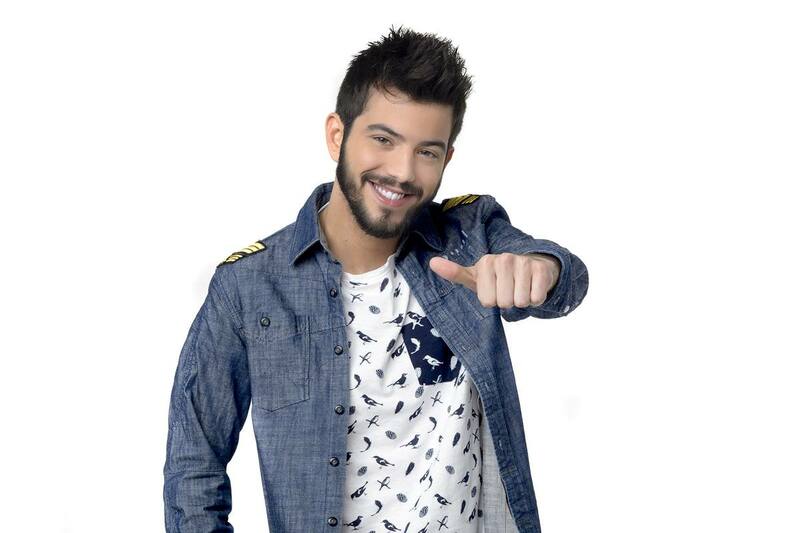 \ Barei has published samples of "Who Plays The Drums? 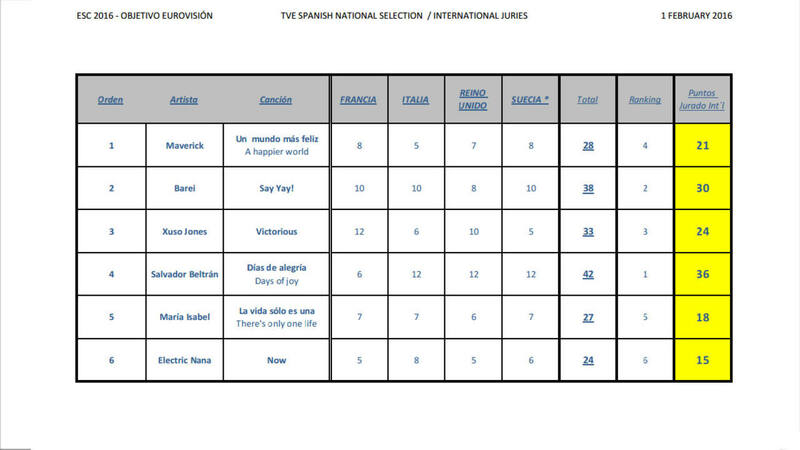 ", the other song she has submitted to RTVE alongside to "Say Yay!" for possible Eurovision participation. Earlier, Barei has stated she has proposed several entries to the national broadcaster. Barei continues to work daily on her stage presentation for Stockholm. In recent days the Spanish representative has replaced the choreographer of it, reports eurovision-spain.com. There appeared problems of time and logistics to implement earlier planned work with German choreographer Fritz Mensch, and Spanish team has to invite new choreographer, Laura Garcia Lopez, who will now take care of the further development of the performance. "Fritz is very good choreographer, there are few his proposals that we will leave in the choreography, and then there will be new professionals here who can develop the ideas I have, with a more contemporary, different concept", says Barei. Professor of street jazz Laura García López is a member of the dance and percussion company Mayumana. She worked as choreographer of different events and with such artists like Alejandro Sanz, Belle Pop, Miguel Saez, Roser, Malú, Edu del Prado, Lord of the Drums, was choreographer and coach of program Popstars of Tele 5, musicals Flashdance and Pretty Woman my love. Barei has filmed her official postcard for the Eurovision 2016 on streets of Madrid. Postcards of the artists are filmed this year in the places that have great meaning for them, which in the case of Barei includes the city of Madrid and other favorite environments. Postcards also incorporate the "magic" of the Eurovision 2016 logo, a dandelion which also resembles the shape of the Stockholm Globe Arena, where the contest will be held. While Swedish television crew has travelled to Madrid, the editors of RTVE.es César Vallejo and Irene Mahía have made ​​the reverse journey and are currently in Stockholm filming a documentary, more information on which will be revealed soon. 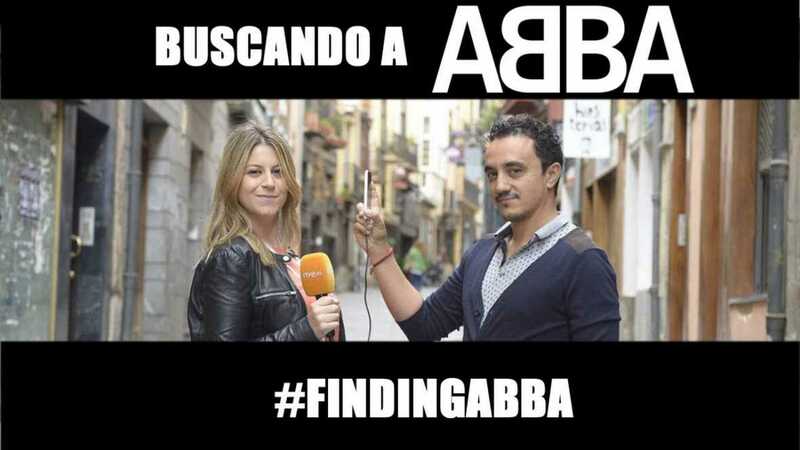 And, between the shootings, you can follow exclusive content they have prepared for Periscope: #findingABBA. It's a special format made for Periscope in which some of the most famous Periscope users try to realize their biggest dream: meet in person the members of ABBA. RTVE has released music video for "Say Yay!". The premiere took place during the broadcast of the online program Bareivisión , where Spanish representative has answered questions from fans. Modern aesthetics, internationalism, new arrangement of the song and a lot of feet movement are some of the ingredients of the video for "Say yay!" directed by Gus Carballo. Barei has revealed her team for Eurovision 2016, five backing singers will accompany her on the Stockholm stage. Very experienced backing team includes: Rebeca Rods (Eurovision 2007 and 2012), Milena Brody (Eurovision 2013), sisters Alana Sinkëy and Awinnie MyBaby (Eurovision 2014) and Brequette (national final 2014 participant). Five choir members were chosen by Barei together with the teams of RTVE and Universal Music Spain. Meanwhile, music video for "Say Yay" will be presented on Thursday, March 10th during a online video broadcast with Barei's participation. Rebeca Rods (backing vocalist for Pastora Soler and D'Nash) has the extensive experience in studio and being session singer, has recorded vocals for the multiple CDs, music videos and live tours for the artists like Alejandro Sanz, Raphael, Laura Pausini, Pastora Soler, Pitingo, Paulina Rubio, Carlos Baute, Coti, Marta Sanchez, or Malu. She has also recorded commercials, jingles and radio and TV headers, works as a vocal coach in 'Got Talent España', and did dubbing for Walt Disney / Pixar. She comes from town of Vigo and was born in a music family. She is passionate about the Gospel, was a member of the choir Inside Voices, and in 2009 created her own choir Black Light Gospel Choir, one of the most prominent on the national scene, with which she has released three albums and produces now fourth. The sisters Awinnie MyBaby and Alana Sinkëy (backing vocals for Ruth Lorenzo) have origins in Guinea-Bissau and were born in Portugal, also coming from a family of musicians. After joining the choir Gospel Factory, Awinnie has joined Watch Out, one of the pioneering groups of the genre Funky Blues in Madrid and participates in different musical projects, both as a lead singer and as a backup singer, singing in different venues and festivals and participating in record works by artists such as Alana Sinkëy or Diego Guerrero. She is planning a move to the UK to create her own personal musical project and explore her own style. Meanwhile, Alana is a self-taught singer and songwriter who moved to Madrid aged 18 years to start her career with a personal project of indie / folk music. She is known on the Madrid music scene for her performances and collaborations with various bands, Alana is vocalist in CosmoSoul group, participates in projects such as Patax or Gospel Factory and collaborates with artists like Miguel Poveda and Eva Yerbabuena, among others. Milena Brody (backing singer for El sueño de Morfeo) is a singer and violist born in Brody, Ukraine, who came to Madrid in the age of 9. She has trained her skills working with such professionals like Liliana Aracil, Verónica Ferreiro or Celia Mur. She is member of Spin Gospel, band with four female voices combining gospel and soul. Member of the Philharmonic Orchestra of Spain, she has been a student of Alan Kovacs, of the School of Music Grappelli, and has been part of the Youth Orchestra of the Community of Madrid. The combination of her two artistic facets has led her to obtain special mention at the School of Creative Music and accompany artists like Alejandro Sanz, Laura Pausini, Ricky Martin, Carlos Marin, Xuso Jones, Manuel Carrasco, Marwan, Paula Rojo, among others and currently is starting her own project. Brequette (participant of Mira quién va a Eurovisión 2014), is an artist with a powerful voice, charisma and overflowing energy both on and off stage. Besides being singer, she also is songwriter and dancer. She has participated in several national television programs and shared the stage with artists such as David Bisbal, Pastora Soler, or Neus Ferri, among others. In 2014 her song " Mas / Run ", with which she competed at the national preselection, reached the top spot on digital platforms in Spain. She is currently recording her new album which will be released in 2016. Another important member of Barei's team in Stockholm is German choreographer Fritz Mensch . A young professional passionate about creating emotions with movements, a mix of contemporary dance, hip hop, jazz... who taught in two prestigious schools in Berlin (Flying Steps Academy, Motion*s Dance Studio). As a dancer he has participated in numerous events (FIFA World Cup Women, Cymnastics Europe Championship...) and television programs as 'Got to Dance 2014', among many others. The team is competed with set designer Florian Boje from Gio Forma Studio. Founded in 1998 in Milan, studio is made of designers, architects, visual and creative artists with a multidisciplinary approach to production design. In almost 20 years of experience, Gió Forma has created concepts, designed and directed thousands of events, television shows, live concerts, exhibitions and ceremonies worldwide. 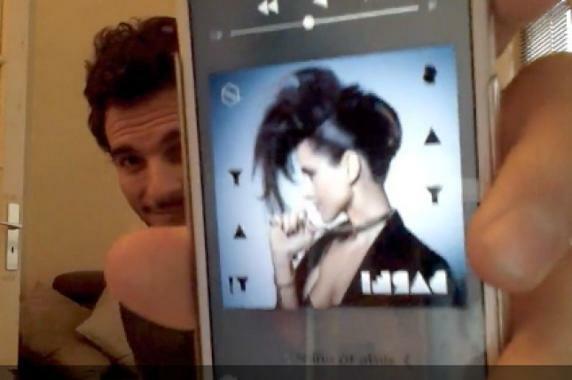 Barei has started recording the music video for "Say yay!". The video will premiere in March at RTVE, and via EBU will be delivered to all participating broadcasters. The recording took place in a tunnel located in the Madrid district of Las Tablas, in which Barei danced accompanied by dozens of fans who came to the place. The fans (who, of course, have learned to perfection dancing chorus) star in some of the sequences of the video for "Say yay!" which, as the artist explains RTVE.es, "will give a special magic to video". "I'm now here because the people voted for me, as I didn't even expect to win. So I find it nice to reward everyone with a feature in this video," adds the artist. Barei explained that "The song is about self-improvement, about keep trying, to live the moment and not give up life and this is what we wanted to symbolize in the video. The leitmotif of the song reflects that something which seems difficult, but if you try again and again, you end up getting it". In addition to the sequences recorded this week in Madrid, the video will have a marked international character, and will be filmed in other cities such as Havana, London, Miami and, of course, Stockholm, Eurovision capital. Director of it is Gus Carballo, who also did the latest videos of Barei. He has experience working with such artists as Diego Torres and Ruben Blades, Macaco, Pablo Alboran, Pablo Lopez and Juanes, Manuel Carrasco, Wally Lopez, Antonio Orozco and Vanesa Martín. Grabación del videoclip de "Say yay!" Upon her return from Ukraine, representative of Spain Barei will start shooting music video for her contest entry "Say Yay". But anyone has a chance to become a star of the video. For that you need to dance a traditional Barei-style dance. How to do it, singer herself explains in this video. Film video with your dance and send it by 19 February to arrobaequipo@gmail.com . Additional details (in Spanish) are available here. Representative of Spain Barei during the online-conference "Vodafone Yu, No te pierdas nada" has informed that she was invited to perform as a special guest of the 2nd semifinal of Ukrainian Eurovision preselection to take place this Saturday. Singer has noted that perhaps it's organizers liked a lot her rendition of Dancing Lasha Tumbai, which she made in one of Periscope broadcasts for the fans. Also Barei informed on planning to attend Eurovision promo-events in Amsterdam and Moscow. "I am super happy to go wherever they call me. I am also nervous because it's obviously something new for me, but I'm excited and it's a privilege. I'm eager to make the most of this experience", say Barei. "I've always wanted to cross borders and bring my music to Europe and finally I have the opportunity. I really want to see the first reaction outside of Spain". Spain's 2016 Eurovision Song Contest entry has been criticised by a member of the country's top language authority because it is entirely in English. The track, called Say Yay, will be performed by Madrid-born singer Barei at the annual extravaganza in Stockholm in May. It marks the first time that the country's offering features no Spanish at all - something which has irked the Royal Academy of Spanish Language (RAE), the official body responsible for overseeing the language's use, reports BBC Monitoring. "Bearing in mind that Spanish is a language spoken by 500 million people, presenting a song in English is surprisingly stupid," academy member Jose Maria Merino is quoted as saying by El Pais. He says the country's public broadcaster RTVE, which runs the selection show, has a "moral and cultural responsibility" to protect the language. The academy took similar umbrage to the mixed English-Spanish lyrics of the country's 2014 entry. In January, Barei defended her song after the broadcaster asked her to include some Spanish lyrics. "I have nothing against our language, of course, but my project is in English," she said. "We might not like it, but it is much more international than Castilian". At the post show conference she made it clear again that she wants the song to be performed completely in English in Stockholm. She'll be hoping the change of language prompts a reversal in Eurovision fortunes for Spain, which hasn't tasted success for more than 40 years. Winners in 1968 with the imaginatively titled La, La, La, it shared the glory with three other countries a year later, in a rare four-way tie which included Lulu's Boom-bang-a-bang. While several past entries have featured some lyrics in English, the 1978 offering also dabbled in French. Broadcaster suggested fans to submit the names of artists they would like to see competing in the preselection in social networks with #euroapuesta hashtag. During the day most popular names were Xuso Jones and Raul Gomez, followed by Maverick. Female singers María Isabel (Eurovision Junior), Eva Ruiz (La Voz Kids), María Villalón (Factor X), Lorena Gómez (Operación Triunfo) and Sara Serena (Aim2Fame) were proposed. Among possible returning singers were mentioned Brequette and Coral Segovia. The names of official participants were revealed by RTVE on 29 December between 10:30 and 13:00 CET. 30-second extracts of participating entries were published on 19 January, while full songs first presented on 20 January at 17:00 in an RTVE online special, listen to them here. Xuso Jones will perform at the contest song written by Swedish songwriters Andreas Öhrn (Gravitonas) and Peter Boström. He describes his entry as "very cool, that goes crescendo and ends in a huge way". He also promises to devote a lot of time to the staging the performance, which he would like to be "visual and modern", and to keep his fans updated on every step of his preparations for the event publishing daily diaries. Xuso explains that his Eurovision enthusiasm came thanks to Ruth Lorenzo. "She's like a sister to me and she told me that Eurovision was one of the best experiences of her entire life, not just the festival itself, but also the eurofans. So I really want to be there! ", says the singer. Jesús Segovia, better known by his stage name, Xuso Jones, was born in Murcia in 1989. He is a singer and songwriter who, already at school, became interested in music. He is also a graduate in tourism and an entrepreneur. He is a self-taught guitar and piano player, which he learned via the internet. In 2009 he began to upload videos performing his own songs and covers on YouTube and in 2011 he reached two million views. As a result he went to Los Angeles to work with different musical producers, releasing his first album Part I in 2013. That year he also wrote for the soundtracks of several movies and songs for other artists in Mexico, China and Spain. In addition, Xuso is a familiar face for the Spanish public as he's participated in popular TV shows. Earlier this year Xuso Jones released his new album Vuela where he wrote or co-wrote every track. Xuso Jones lives in Madrid and frequently travels outside Spain to work on new music. Second finalist of the preselection Salvador Beltrán composed his entry together with Miguel Ángel Arenas 'Capi'. With his song "full of optimism" Salvador wants to show the Europe the "cheerful character of the Spaniards". "The song speaks about days of joy. If we have bad days, we need to think about the good experiences and the people who love us", explains the singer RTVE.es. His entry "will have a touch of Spanish folklore by the prominence of the guitar and the vocal, but also has touches of Brazil, is a fairly latino song. I think I could define it as a kind of funky latino with lyrics that everyone will be able to identify themselves with". Salvador Beltrán (El Prat de Llobregat, Barcelona, 1992) is not a newcomer. He cites his Andalusian mother as the reason for his music taste since childhood. At age 13 he started playing guitar and then also the piano. Besides flamenco he also mentions Joan Manuel Serrat as one of his references. Supported by Spanish top star, Alejandro Sanz, he released his first album Change Of Plans in 2012, for which he won Best Newcomer at one of Spain's main music radio stations, Cadena Dial. Salvador's second album Reflejos de mi camino, came out this year with a repertoire of songs bringing together rock, reggae, bossanova and funky pop, all under his melodic light. Salvador writes all his material which has an international flair not forgetting its pure origins. "In recent years very respected Spanish performers took part in the Eurovision, bringing it popularity to the new spectacular level. And I think that the moment has come: I have an appropriate song to participate and with which I can leave my soul on stage". Third finalist Maverick takes part in preselection with a latin song written by Juan Magán, Darlyn Cuevas "DCS" and Luiggi Giussepe Olivares. "It is a song intended to make the audience stand up and start dancing along with the music", tells Maverick, explaining his entry is more latino rather than electro-latino that was made famous by Juan Magan. For a long time Spain has not entered Latin songs in the Eurovision, and Maverick claims it's time to bring this style back to the contest: "it works well for us, it's in our roots, it's what people in Europe associate Spain with". Also he plans to accompany his song with correspondent choreography. 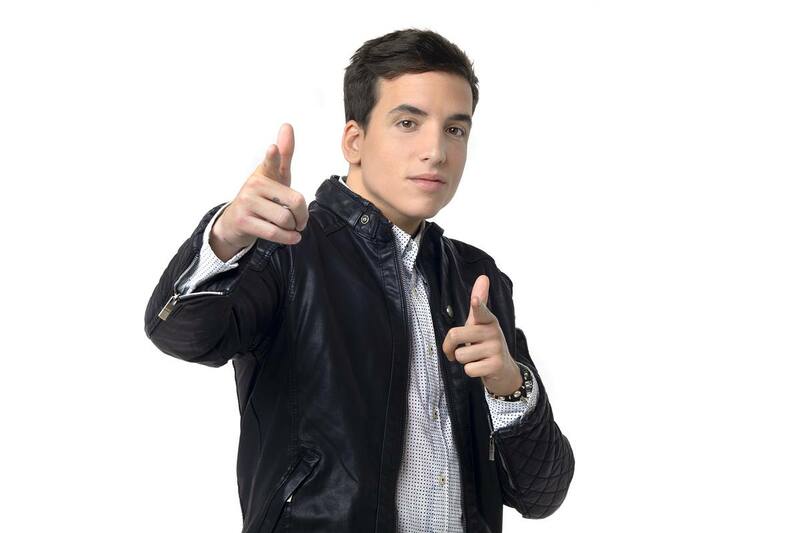 The life of Maverick (Vinarós, Castellón, 1996) has taken a turn with only 19 years of age, when he became one of the finalists in the last edition of The Voice, coached by Laura Pausini. 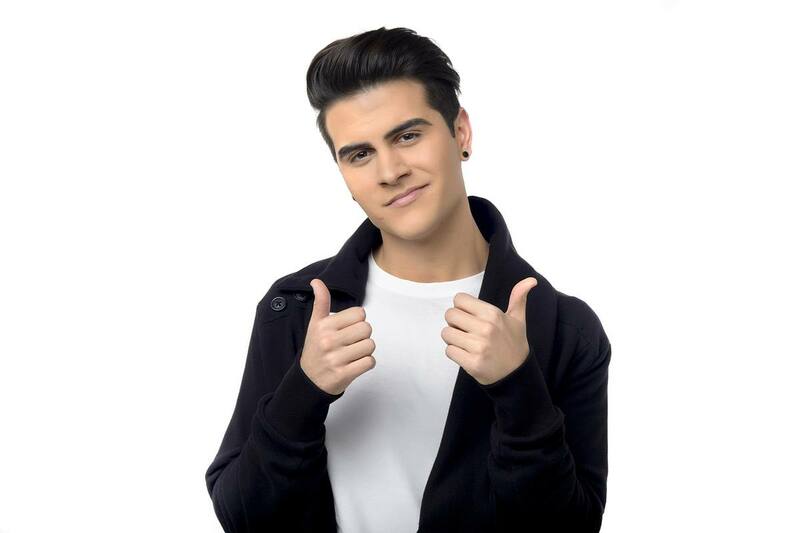 After his first single Princesa Descalza, an album has followed with new songs, one written by Pausini and others by himself, plus some of his best performances in the TV show. Ballads, latin, r'n'b and funk- with a current pop filter- are the styles to be found in his album 18 +1. Maverick has been singing and dancing in school festivals from an early age and, when he was 5, he took part in the popular Spanish singing competition Veo Veo; at 13 he decided to devote himself to music and, after finishing his studies, he settled in Madrid. This young singer performs many different music styles and has trained his voice in a very wide range. María Isabel will perform at the national preselection song composed by David Santisteban, which she describes as "danceable, with very fresh air, which I think people will like, and which fits me the best". María Isabel López Rodríguez, (Huelva, 1995) rose to fame in 2004 when she was only nine years-old, winning the Junior Eurovision Song Contest with her huge success Antes Muerta Que Sencilla. Her young flamenco rhythm established her as a great little artist. That song was part of her debut album and she released four other LPs up to 2009. Her success helped her to travel to America and Japan, performing at the best stages and programs in many countries. After participation as guest in Junior Eurovision 2010 Maria isabel has almost disappeared from public view, making comeback this November with a new album Yo decido. Singer assures that she hasn't changed much with the years: "My voice is still recognizable and I still retain my childish side, I'm still very small girl and I keep the same desire to live music I had when I was 9-years old , because it is my dream and I will never get tired of fighting, as this is what excites me the most in the world". Electric Nana will perform her self-written song at the national final. She describes her song as world indie pop, and says it is aimed to "make everyone feel good, connect with the people, make them smile and have a good time". Monica Vazquez, Electric Nana was born in Madrid in 1987. At 14 she started writing music and playing piano and guitar. She writes, arranges and produces her own songs, creating fresh and original music. Her passion for music makes her an artist able to write different types of music and in several languages ​​(English, Spanish or French), she is bilingual and has a degree in Journalism. His first stage appearance as Nana Electric dates from 2007 and four years later, in 2011, she rose to fame with the Plan B by Carlos Jean's Plan B and his songs Lead The Way and Gimme The Base, which reached #1. She's also penned songs for soundtracks, commercials and other artists like DJ Nano, Why Five, Check Baby Check or Carlos Jean. Earlier this year she released her first album To Life!, fully written in English by Electric Nana, including a goo mix of rock, folk and electronic music. Her songs are optimistic to celebrate life in its broadest sense. "Since I can remember myself, I have not missed a single year of Eurovision, I always told everyone that I wanted to be there and I never understand when sometimes musicians are afraid to participate in this contest, but I'm very excited and I think I have a right song that will make people excited as well. It's not something I'm doing just for promotion, my biggest dream is to go to Eurovision. For me it is all about lights, music, flowers, applause, dancing, extraordinary things - the most wonderful party the world. It's so beautiful that, whatever happens, every year all the people of Europe come together and celebrate the music. I find it fascinating and my dream is to experience it in person, says Electric Nana. Barei aims to win the Spanish national final with a song written by Ruben Villanueva and Victor Pua Vivó, which she describes as having "pop electronic base and a very modern sound, American pop, soul and black music influences, a song that everyone can relate to, that speaks of never giving up". Bárbara Reyzábal (1982) is Barei, singer and songwriter with two albums on the market, Billete para no volver and Throw The Dice, and a music career spanning over 16 years, with influences of American pop, soul and black music. Barei, who has studied music theory, singing, guitar, piano and participated in the Benidorm Festival before travelling to Miami, where she began to compose her demos. On her return to Spain she performed in the main stages of Madrid. This year she performed at the Starlite in Marbella. Barei sings and writes mainly in English and has penned songs for other Spanish artists such as Malu and Edurne, or the Japanese singer J. May and has also done some music works for television. She has an energetic and direct style, trying to cause a commotion on the listeners. Among her references, Michael Jackson, Stevie Wonder, OneRepublic, Maroon 5, Sia or Pink. Pt: Mr. Nicola Caligiore - 37 - HoD Italy, manager for international relations RAI. Mrs. Marta Cagnola - 41 - Journalist, presenter and music expert "Radio24" - "Il Sole 24 Ore"
Mr. Eddy Anselmi - 46 - Journalist and expert of Sanremo Festival and Eurovision. Mr. Emanuele Lombardini - 40 - Journalist and blogger, founder of EurofestivalNews. Mrs. Cristina Giuntini - 49 - President of OGAE Italy. Pt: Mr Christer Björkman - 58 - Producer Eurovision 2016, SVT Melodifestivalen 2016, HoD and artist. Mr Samuel Andersson - 28 - SVT, Assistant Producer Eurovision 2016. Mrs Åsa Paues - 52 - PR manager, ESC press officer and eurofan. Pt: Mrs. Helen Riddell - 38 - BBC co-HoD of British delegation. Барей (Барбара Рейсабаль Гонсалес-Аллер) родилась в Мадриде 28го марта 1982 года. Барей - певица и автор песен, чьи музыкальные влияния включают в себя творчество Майкла Джексона, Стиви Уандера, Ареты Франклин, фанк-музыки Джеймса Брауна, синтезированных поп-влияний Кэти Перри, Мадонны и Брюно Марса. Барей всегда стремилась к преодолеванию барьеров и считало это ключем к полноценной музыкальной карьере. Сейчас у нее на счету два альбома, Billete para no volver and Throw The Dice, а за спиной музыкальная карьера в 16 лет, основанная на американской поп, соул и танцевальной музыке. Молодая певица также имеет на своем счету песни для таких артистов, как Malu, Edurne и японская певица May J, а также ряд саундтреков для телевидения. Барей описывает себя как естественную, харизматичную и наполненную энергией. Барей изучала музыкальную теорию, пение, игру на гитаре и фортепиано, приняла участие в Festival de Benidorm, а затем отправилась в Майями, где приступила к написанию собственных песен. Именно там, на концерте на одной из популярных площадок Miami Beach, она и ощутила последний импульс, приведший к решению полностью посвятить себя музыкальной карьере - писать и исполнять песни, делясь своей жизнью через буквы и мелодии с миром. В этой попытке и родился дебютный альбом певицы "Billete para no volver" (2011), полный песен об эволюции, изменениях, росте, и выборе того, кем бы мы хотели быть. После возвращения в Мадрид она выступала на всех крупнейших площадках столицы Испании. В 2012 году певица решает остановиться на английском языке для своих выступлений, поскольку основными музыкальными влияниями для нее продолжают оставаться американский и британский поп, соул и фанк, и она наиболее комфортно чувствует себя в написании и исполнении треков на английском языке. Барей начала свою музыкальную карьеру, бросив вызов "Single a Single", приняв твердое решение выдавать своим поклонникам по одной новой песне каждые три месяца. С релизом "Синглов" появлялся и видеоклип, объясняющий ее превращения как женщины и певицы, и нацеленный стать саундтреком к жизни его зрителей. Первый такой сингл, "Play" попал в топ 5 самых продаваемых поп-песен на iTunes, а видеоклип на него собрал свыше 150 тысяч просмотров. Следующим вызовом для Барей стало не достижение знаменитости, а закрепление узнаваемости. Второй сингл "Another's Life" стал не менее успешным, попав в топ 30 самых продаваемых песен на iTunes, а видеоклип на него просмотрели свыше 600 тысяч раз, что сделало песню одним из крупнейших релизов испанской музыкальной сцены. Очередным треком стала песня "Foolish NaNa", которую посмотрели на Youtube свыше 1 миллиона раз. С желанием поддерживать общение с поклонниками на каждом этапе своей карьеры, Барей решила дать им возможность выбора следующего сингла, выложив три демо-записи на своей странице в социальной сети. "Wildest Horses" собрала наилучшие отзывы - песня, наполненная вопросами о любви и дружбе, которую певица посвятила члену своей семьи, умершему от рака. Видеоклип на нее собрал свыше 1.5 миллионов просмотров. Следующий сингл: "You Fill Me Up (My Yang)" - крик о любви, положил конец сингловому марафону и стал последним связующим звеном перед выпуском в апреле 2015 года второго студийного альбома певицы "Throw The Dice" (апрель 2015), который достиг топ 10 списка наиболее продаваемых альбомов на iTunes в момент его выпуска. В прошлом году певица выступила на фестивале Starlite в Марбелье. Барей одержала победу на национальном отборе с песней "Say Yay!" авторов Rubén Villanueva и Víctor Púa Vivó, который она описывает как "имеющий электро-поп основу, современное звучатие, влияния американской поп-музыки, соул и черной музыки, песню, с которой соотнести себя сможет каждый, рассказывающей о том, что никогда не надо сдаваться". "Я пишу песни на английском, и создаю международную и современную поп-музыку, с песнями, которые содержат ясный месседж. Я считаю, что мои дальнейшие профессиональные шаги должны происходить за пределами Испании, потому что моя музыка более подходит для международной сцены. И Евровидение предоставляет моей карьере подобную возможность", говорит певица. "Я считаю, что ключ к победе - это международный трек, который может подойти для радиостанций всего мира, такой как "Heroes" - песня, победившая на Евровидении 2015, а также треки представительниц России и Латвии этого года". "Это - самая прекрасная возможность пересечь границы и поделиться своей музыкой со всеми в Европе. Я обожаю встречаться с различными людьми и учусь чему-то у каждого из них. Конкурс Евровидение также означает дисциплину, серьезную работу и самопознание: оно поможет моему профессиональному и личному росту"
Представительница Испании Барей в прошлую субботу посетила Киев, где выступила в качестве гостьи национального отбора Украины. ESCKAZ получил возможность пообщаться с исполнительницей и узнать о ее планах подготовки к международному шоу. Как обычно, мы начали с поздравлений с победой на испанском отборе "Objetivo Eurovisión". "Спасибо! Я очень благодарна всем и с нетерпением жду, что же будет дальше. Теперь пришло время работать в полную мощь, чтобы быть на высоте", ответила Барей. Певица рассказала нам, что это не было ее собственной идеей принять участие в испанском отборе, но один из членов ее команды отправил ее кандидатуру на телеканал RTVE и им очень понравился ее проект. Через несколько дней ей позвонили и сообщили о том, что RTVE думает о том, чтобы включить ее имя в список кандидатов в борьбе за право представить эту страну на конкурсе. Следующей задачей был поиск наиболее подходящей для этого песни. "Say Yay! была написана специально для этой возможности. Вначале, мы рассматривали еще две возможные композиции, но в итоге решили написать полностью новую песню, которая бы содержала в себе все необходимые ингридиенты для того, чтобы убедить Европу за 3 минуты. Она должна была полностью соответствовать моему стилю, быть запоминающейся, и такой, чтобы как можно большее количество людей могли соотнести себя с ней. "Say Yay!" - это мощная песня, полная энергии и правдивости!" Барей говорит, что вероятно в композицию еще будут вноситься небольшие изменения, в плане продакшена, микширования и аранжировки бэк-вокальной партии на треке. "Но, когда что-то уже добилось успеха в той форме, в какой оно есть, нужно быть осторожным с любыми изменениями... иначе люди могут просто запутаться между всеми этими разными версиями". Певица, очевидно, устав от постоянного вопроса, не планирует ли она записать версию песни на испанском, говорит, что это не произойдет, по ее мнению песня просто "не зазвучит" на испанском. Команда исполнительницы уже приступила к работе над номером для Евровидения. "В нем должно быть что-то достаточно простое, что не будет отвлекать от самой главной вещи: самой песни", считает Барей. Певица напоминает, что ее команда все еще принимает предложения возможной постановки номера от всех желающих, их нужно присылать на sayyay.sugerencias@gmail.com. На вопрос о том, какой костюм она выберет для Стокгольма, Барей говорит, что пока известно только лишь то, что она не будет петь на каблуках! Ее команда в настоящее время связывается с различными дизайнерами, пытаясь определить наиболее подходящие опции. "Мне нужно петь, танцевать, и оставаться сфокусированной. Потому, я должна чувствовать себя очень комфортно на сцене", поясняет она. Когда речь зашла о планах на съемку видеоклипа на конкурсную песню, Барей радостно воскликнула: "Дааааааа! Конечно, мы будем его снимать! Позитивная энергия! Танцы и тусовка! Он будет метафорой для фразы "продолжай пытаться", а не умри пытаясь". Певица вновь напоминает, что и здесь ждет помощи от своих поклонников, которые могут попасть в клип, подробнее об этом здесь. Барей говорит, что не рассчитывает на достижение какого-то определенного результата на конкурсе, а лишь хочет выложиться на все 100% и хорошо поработать, чтобы показать себя в вечер финала с наилучшей стороны. Самым сложным в подготовке к Евровидению для нее является то, что работать приходится 24 часа в день. "С 1го февраля мы работаем просто НОН СТОП!, рассказывает она. Помимо выступления в Украине, у Барей также есть планы посещения других промо-мероприятий перед Евровидением. "Для меня было бы удовольствием продолжить продвигать свою музыку за пределами Испании. Скорее всего, я буду в Амстердаме, Лондоне и Москве, но пока окончательно точно мы еще не знаем". Она уже прослушала большую часть из выбранных песен, и своими фаворитами называет "Sunlight" от Ирландии и "What's the pressure" от Бельгии. Одним из регулярных наших вопросов в этом сезоне будет любимая песня Швеции на Евровидении и Мелодифестивалена, и Барей, не задумываясь называет "Heroes" Монса Зельмерлёва - "Не могу дождаться встречи с ним в этом году, хахаха!. Помимо Евровидения, певица также работает над предстоящим переизданием ее недавнего альбома "Throw the dice", в которое войдет ее конкурсная песня "Say Yay" и еще одна или две ранее неопубликованных песен, он должен появиться в продаже этой весной. Всем читателям этого интервью Барей говорит: "Никогда не позволяйте кому-то указывать вам, что вы можете делать, а что нет. Свобода воли - это все, что вам нужно для того, кем вы хотите быть. Большое спасибо вам за поддержку и тысячи поцелуев!". Певица Барей сообщила некоторые детали своего костюма для Стокгольма. По словам певицы, первой ее идеей было длинное платье. Но, попробовав его на репетиции, она поняла, что это не сработает. "Я не могу в нем полностью себя выразить, это не я, я чувствую себя связанной", говорит Барей, которая предпочла для выступления на конкурс нечто более комфортное, а также кеды, которые уже давно ассоциируются с образом певицы. В итоге, она обратилась за помощью к стилисту TVE и модельеру Раулю Амору, который создал несколько костюмов - некоторые более легкие, некоторые более изощренные - которые Барей будет носить на различных мероприятиях в Стокгольме. На финале Евровидения мы увидим 100% Барей, говорит она. Певица добавляет, что оденет нечто, более похожее на певицу Рианну или на шведскую певицу Лорен, но ее стиль не будет иметь ничего общего с Эдурне, Рут Лоренцо или Пасторой Солер. "Эти платья подходят для баллад, но не для быстротемповых песен", объясняет она. Представительница Испании Барей завершает последние репетиции в Прадо дель Рей перед своей поездкой в Швецию, а на этой неделе примет участие в двух крупных мероприятиях. В четверг она станет почетной гостьей приема в шведском посольстве Мадрида. Посол Сесилия Хулин поприветствует исполнительницу, а та специально исполнит свою конкурсную песню "Say Yay". Также на сцене выступят шведский гитарист Густав Лундгрен и Хор Скандинавской школы. В пятницу в 19:00 Palacio de la Prensa Мадрида превратится в настоящий Евроклуб. RTVE и Барей проведет Евровечеринку, в рамках которой певица даст полноценный акустический концерт, где будет исполнена не только "Say Yay", но и другие песни из ее альбома "Throw The Dice", который был недавно перевыпущен Universal Music Spain. Билеты на посещение концерта можно забрать в четверг 28 апреля с 16:00 в Palacio de la Prensa. Десять счастливчиков также получат право встретиться с Барей лично, и обменяться с ней мнениями о ее предстоящей поездке в Стокгольм. Представительница Испании Барей присоединилась к тем, кто считает, что Россия не должна проводить конкурс Евровидение. Побывав на вечеринке в Москве, певица рассказывает, что своими глазами увидела отношение местных жителей к людям нестандартной ориентации. "Очень многие поклонники Евровидения беспокоятся о том, что Россия может победить на конкурсе, и не хотят ехать в Москву в следующем году из-за боязни предследования гомосексуалистов. Я думаю, что это действительно большая проблема. В конце-концов, известно, что 90% поклонников Евровидения - гомосексуалисты. Если бы я сама была нестандартной ориентации, я бы, зная о том, как в России относятся к геям, никогда не проголосовала за Россию. Ради всеобщего блага...", заявила певица в интервью Лавангуардия. "Я побывала в Москве, и была шокирована сразу после приезда. Мы прилетели вместе с представителем Израиля Хови Старом, которому пришлось вытерпеть издевательства в аэропорту Москвы. К нему отнеслись отвратительно. Над ним просто ржали. Он выглядит довольно женственно, с макияжем... и мы прилетели из Риги, вместе, и проходили паспортный контроль. Собралась толпа народу, чтобы посмотреть на него. Все смеялись над ним. Они порвали ему обложку паспорта, когда все изучали ее. Вели себя абсолютно беспардонно. Я знала, что в России может произойти подобное, но не думала, что мы столкнемся с этим уже в аэропорту и в таком виде. Потому я задумалась о том, что же будет со всеми Еврофанами, если победит Россия?" "Я не говорю, что артист не заслуживает победы, но происходящее в России - совершенно другой вопрос. Хотя меня лично выступление Сергея ничуть не тронуло. Он кажется достаточно холодным. Очень много визуальных эффектов, но сама песня прошла мимо меня, я не смогла запомнить ни ее мелодию, ни ее исполнения. Я помню как там девушка к нему тянулась через пропасть, но саму песню не помню совершенно. Мне кажется они слишком перегрузили клип информацией, что песня отошла на далекий план". "Очень сильным кандидатом я считаю Францию. Мы очень хорошо подружились с Амиром. Он даже записал кавер на мою песню. Мы вместе учились танцевать мои шаги. Мне очень нравится Кипр, замечательная рок-песня. Швеция, простая композиция, но никогда не надоедает. Мне нравится Мальта, но она очень мне напоминает Running Бейонсе... Финляндия, Бельгия, потому что они похожи на мой собственный стиль"
Также певица рассказала, что считает абсолютно неверными любые отговорки о том, что кому-то не удалось добиться успеха на Евровидении по политическим факторами. "Будет сложно победить, но политика здесь не причем. Пусть я даже займу 25 или последнее место, я не буду винить политику. Я скажу, что сама плохо выступила. Ни TVE, ни политика, ни соседское голосование в этом не будут виноваты. Только я сама несу всю ответственность". Полное интервью (на испанском) вы можете прочитать здесь. Барей опубликовала отрывки песни "Who Plays The Drums? ", которую она также заявляла для участие в национальном отборе вместе с "Say Yay". Ранее, певица рассказывала, что подавала на канал несколько возможных композиций для конкурса. Барей продолжает ежедневно работать над своим сценическим номером для Стокгольма. За последние дни представительнице Испании пришлось заменить хореографа своего номер, как сообщает Eurovision-Spain. С участием прошлого хореографа, Фритца Менша, возникли определенные временные и логистические проблемы, и испанской делегации пришлось пригласить нового хореографа Лауру Гарсию Лопес, которая и продолжит работу над номером. "Фритц - хороший хореограф, есть несколько его идей, которые мы оставим в нашей хореографии, а новые профессионалы уже продолжат развивать те идеи, которые у меня есть, создав более современную, иную концепцию", говорит Барей. Профессор стрит-джаза Лаура Гарсия Лопес входит в состав танцевально-перкуссионной группы Mayumana. Она работает в качестве хореографа с различными мероприятиями и такими артистами, как Алехандро Санз, Белле Поп, Мигель Саез, Росер, Малу, Эду дель Прадо, Lord of the Drums, была хореографом и педагогом в программе Popstars телеканала Tele 5, мюзиклов Flashdance и Pretty Woman my love. Барей сняла свою открытку для Евровидения 2016 на улицах Мадрида. Открытки артистов в этом году снимаются в местах, которые имеют для них большое значение. В случае Барей - это город Мадрид и его обстановка. Открытки также включают в себя "волшебство" логотипа Евровидения 2016, одуванчика, который также напоминает очертания Глобен Арены Стокгольма, где состоится конкурс. В то время, как Шведское телевидение прибыло в Мадрид, редакторы портала RTVE Сесар Валлехо и Ирене Махия отправились в противоположном направлении, и в настоящее время снимают в Стокгольме документальный фильм, информация о котором станет известна позднее. В перерывах между съемками, вы можете следить за эксклюзивным контентом, который они подготовили для Periscope: #findingABBA. Это - специальный формат, созданный для Periscope, в котором некоторые известные пользователи пытаются реализовать свою мечту, встретиться лично с членами группы ABBA. RTVE опубликовал видеоклип на песню "Say Yay!". Премьера прошла во время эфира онлайн программы Bareivisión, где представительница Испании ответила на вопросы поклонников конкурса. Современная эстетика, интернационализм, новая аранжировка песни и много движений ногами - некоторые из ингридиентов видеоклипа на "Say Yay! ", который снял режиссер Гус Карбальо. Барей объявила состав своей команды для Евровидения 2016, вместе с ней на сцене Евровидения выступят пять бэк-вокалисток. Опытный хор включает в себя Ребеку Родс (Евровидение 2007 и 2012), Милену Броди (Евровидение 2013), сестер Алану Синкей и Авинни МайБэйби (Евровидение 2014) и Брекетт (участницу национального отбора 2014 года). Бэк-вокалистки были отобраны Барей вместе с командами RTVE и Universal Music Spain. Тем временем, премьера видеоклипа на песню "Say Yay" пройдет в четверг, 10го марта, во время онлайн видео эфира с участием самой певицы. Ребека Родс (бэк-вокал Пасторы Солер и D'Nash) имеет большой опыт работы в студии и в качестве сессионной вокалистки, записывала вокалы для многочисленных дисков, видеоклипов и выступала на концертных турах с такими артистами, как Алеханро Санс, Рафаэль, Лаура Паузини, Пастора Солер, Питинго, Паулина Рубио, Карлос Бауте, Коти, Марта Санчез и Малу. Также она записывала рекламные ролики, джинглы и радио и ТВ заставки, была педагогом по вокалу в 'Got Talent España', и занималась дубляжом для студии Walt Disney / Pixar. Она - родом из города Виго и родилась в музыкальной семье. Ее главной страстью является музыка в стиле госпел, она была участницей хора Inside Voices, а в 2009 году создала свой собственный хор Black Light Gospel Choir, один из наиболее известных на национальной сцене, с которым вместе она выпустила три альбома и сейчас работает над четвертым. Сесты Авинни МайБэби и Алана Синкей (бэк-вокалистки Рут Лоренцо) имеют корни в Гвинее-Бисау, а родились в Португалии, также в семье музыкантов. После участие в гостел хоре Gospel Factory, Авинни присоединилась к Watch Out, одной из лидирующих групп в стиле фанки-блюз в Мадриде, и принимает участие в различных музыкальных проектах, как солистка, так и бэк-вокалистка, поет на различных мероприятиях и фестивалях, участвует в записи работ таких артистов как Алана Синкей или Диего Гуерреро. Сейчас она планирует переезд в Великобританию, чтобы создать там свой собственный музыкальный проект. В то же время Алана - певица и автор самоучка, переехала в Мадрид в возрасте 18 лет для того, чтобы начать свою карьеру с личного проекта музыки в стилях инди-фолк. Она известна на музыкальной сцене Мадрида благодаря своему сотрудничеству с различными группами. Алана является вокалисткой в группе CosmoSoul, принимает участие в проектах Patax и Gospel Factory, и сотрудничает с такими артистами, как Мигель Поведа и Ева Ербабуэна, помимо прочих. Милена Броди (бэк-вокалистка El sueño de Morfeo) - певица и скрипачка родом из города Броды в Украине, которая переехала в Мадрид в возрасте 9 лет. Она получила свой первый музыкальный опыт работая с такими профессионалами, как Лилиана Арасил, Вероника Феррейро или Селия Мур. Она входит в состав группы Soul Gospel, квартета вокалисток, совмещающих музыку в стилях госпел и соул. Член Филармонического оркестра Испании. она была студенткой Алана Ковача в Музыкальной школе Grappelli, и выступала в составе Молодежного Оркестра Мадрида. Совмещение этих двух направлений, привело ее к работе с такими артистами как Алехандро Санз, Лаура Паузини, Рики Мартин, Карлос Марин, Сусо Йонс, Мануэль Карраско, Марван, Паула Рохо и др, а в настощее время она готовит собственный проект. Брекетт (участница национального отбора Mira quién va a Eurovisión 2014) - певица с мощным вокалом, харизмой и струящейся энергией как на, так и вне сцены. Помимо того, что она певица, она также является автором песен и танцором. Она принимала участие в ряде национальных телевизионных программ, и выступала на сцене вместе с такими артистами, как Давид Бисбаль, Пастора Солер или Неус Ферри, помимо прочих. В 2014 году ее песня "Mas / Run", с которой она выступала на национальном отборе, достигла верхних строчек хит-парадов цифровых платформ в Испании. В настоящее время она записывает свой новый альбом, который будет выпущен в 2016 году. Еще одним важным членом команды Барей в Стокгольме станет немецкий хореограф Фриц Менш. Молодой профессионал создает эмоции посредством движений, совмещая современный танец, хип-хоп, джаз. Он преподавал в двух престижных школах Берлина (Flying Steps Academy, Motion*s Dance Studio). В качестве танцора он принимал участие во множестве мероприятий (Чемпионат мира по футболу среди женщин, Чемпионат Европы по Гимнастике) и телепрограммах, таких как 'Got to Dance 2014', помимо прочих. Команду завершает сет-дизайнер Флориан Бойе из студии Gio Forma. Основанная в 1998 году в Милане, в студии работают дизайнеры, архитекторы, специалисты по визуальному оформлению с уникальным подходом к созданию дизайна. За двадцать лет опыт Gio Forma создала концепции, дизайн и режиссуру для тысячи мероприятий, телевизионных шоу, концертов, выставок и церемоний по всему миру. Барей приступила к съемкам видеоклипа на песню "Say yay!". Премьера видео пройдет в марте на RTVE, и посредством ЕВС оно будет разослано всем участвующим вещателям. Съемка прошла в туннеле в районе Лас Таблас Мадрида, и в кадре Барей сопровождали десятки фанатов, которые пришли к этому месту. Фанаты (которые, конечно же, разучили до совершенства необходимые танцевальные движения) будут являться главными героями в определенных отрезках клипа "Say yay! ", и, как артистка объяснила RTVE.es, "придаст клипу особое волшебство". "Я попала на Евровидение благодаря тем людям, что проголосовали за меня, я не ожидала победы. Потому, мне показалось правильным, вознаградить своих поклонников тем, что они попадут в видеоклип на песню," говорит певица. Барей объясняет: "Песня рассказывает о самосовершенствовании, продолжении попыток, о том, что надо жить моментом, и не отказываться от этого, и именно все это мы и хотели показать в клипе. Лейтмотив песни отражает то, что что-то может казаться очень сложным, но если ты будешь пытаться снова и снова, то ты в конце-концов получишь это". Помимо отрезков, снятых на этой неделе в Мадриде, видео также будет обладать выраженным международным характером и будет снято в таких городах, как Гавана, Лондон, Майями, и, конечно же, столица Евровидения этого года - Стокгольм. Режиссер клипа - Гус Карбальо, который также снимал недавние видеоклипы Барей. На его счету работа с такими артистами, как Диего Торрес и Рубен Бладес, Macaco, Пабло Альборан, Пабло Лопез и Хуанес, Мануэль Карраско и др. После возвращения из Украины, представительница Испании Барей приступит к съемкам видеоклипа на свою конкурсную песню "Say Yay!". Однако его героем может стать каждый из вас. Для того, чтобы попасть в клип, вам надо станцевать фирменный танец Барей. Как это сделать, певица объясняет в специальном видеоролике. Запишите видео со своим танцем, и отправьте его до 19го февраля по адресу arrobaequipo@gmail.com . Дополнительные детали (на испанском) доступны здесь. Представительница Испании Барей в рамках онлайн-конференции "Vodafone Yu, No te pierdas nada" рассказала о том, что получила приглашение выступить в качестве специальной гостьи 2го полуфинала украинского национального отбора на Евровидение, который пройдет в эту субботу. Певица заметила, что видимо организаторам отбора настолько понравилось ее исполнение песни Dancing Lasha Tumbai, которую она спела для подписчиков ее перископ канала в одном из недавних эфиров. Также Барей планирует посетить промо-вечеринки Евровидения в Москве и Амстердаме. "Я счастлива поехать куда бы меня ни звали. Я немного нервничаю, потому что все это для меня в новинку, но я очень рада, и для меня это большая привилегия. Я хочу набрать как можно больше опыта от этой поездки", говорит Барей. "Я всегда мечтала выйти со своей музыкой за пределы границ, донести ее до слушателей в Европе, и сейчас мне предоставилась подобная возможность. Я очень хочу увидеть первую реакцию за пределами Испании"
Песня, выбранная представлять Испанию на конкурсе Евровидение 2016 года, подверглась критике крупнейшей организации, отвечающей за популяризацию испанского языка, за то, что она исполняется полностью на английском. Песню "Say Yay!" на Евровидении в Стокгольме исполнит уроженка Мадрида, певица Барей. Это может стать первым случаем в истории участия страны на Евровидении, когда песня представляемая ею, не будет включать в себя испанского языка вообще - что вызвало недовольство Королевской Академии Испанского Языка (RAE) - официального государственного органа, контролирующего его использование, сообщает BBC Monitoring. "Принимая во внимание то, что на испанском языке говорят 500 миллионов человек в мире, исполнять нашу песню на английском - невероятно глупо," заявил член академии Хосе Мария Мерино газете El Pais. Он говорит о том, что общественный вещатель страны RTVE, отвечающий за проведение национального отбора, несет "моральную и культурную ответственность" за защиту языка. Академия высказывалась в таком же негативном стиле, когда в песни Испании на Евровидении 2014 использовалась смесь испанского и английского языков. В январе певице Барей уже удалось защитить свою песню, после того, как вещатель предложил ей включить в нее немного испанского текста. "Я ничего не имею против нашего языка, конечно же, но моя музыка вся исполняется на английском", отметила она. "Нам может это не нравится, но этот язык обладает еще большим международным характером". На конференции после шоу она в очередной раз подчеркнула, что хотела бы исполнить свою конкурсную песню в Стокгольме полностью на английском языке. Вещатель предложил поклонникам конкурса присылать имена артистов, которых бы они хотели видеть участниками отбора, посредством социальных сетей с хештегом #euroapuesta. За сутки наиболее популярными кандидатами стали Xuso Jones и Raul Gomez, за которыми следовал Maverick. Также были предложены и кандидатуры исполнительниц María Isabel (Eurovision Junior), Eva Ruiz (La Voz Kids), María Villalón (Factor X), Lorena Gómez (Operación Triunfo) и Sara Serena (Aim2Fame). Среди возможных кандидатов на возвращение в отбор были упомянуты Brequette и Coral Segovia. Имена официальных участников конкурса были названы телеканалом RTVE 29го декабря между 12:30 и 15:00 Москвы. 30-секундные отрывки песен были опубликованы 19го января, а полные песни впервые были представлены в онлайн эфире RTVE в 19:00 Москвы 20го января и прослушать их можно здесь. Xuso Jones, исполнит на отборе песню шведских авторов Andreas Öhrn (Gravitonas) и Peter Boström. Свою песню он описывается как быстротемповую с очень мощной финальной точкой. Певец считает важным уделить большое внимание постановке своего номера, а также ежедневно уделять внимание своим поклонникам, публикуя дневники своей подготовки. Певец Сусо Йонс, чье настоящее имя Хесус Сеговия, родился в Мурсии в 1989 году. В детстве, смотря видеоуроки по интернету, он самостоятельно научился играть на гитаре и фортепиано. Первое признание к нему также пришло на Youtube. Обучаясь туризму, в то же время он записывал любительские версии песен и выкладывал их в интернет. Один из подобных роликов стал вирусным феноменом и собрал свыше 7 миллионов просмотров. В 2013 году, после работы в Лос Анджелесе с несколькими музыкальными продюсерами, Сусо выпустил свой дебютный альбом Part I. Также он начал писать песни для сериалов и других артистов из Мексики, Китая и Испании. Широкая известность к исполнителю пришла после участия в телешоу Tu cara me suena 3 (Один в один). В мае 2014 года в свет вышел второй альбом исполнителя Vuela, в который вошли 10 песен, написанные или им самим, или в соавторстве, включая один трек на английском. Сусо живет в Мадриде, но для работы над своими песнями часто путешествует зарубеж. Певец рассказывает, что принять участие в Евровидении ему посоветовала Рут Лоренцо, которая для него близка как сестра. "Она рассказала, что участие в Евровидении для нее было одним из самых интереснейших событий в жизни, не только само выступление, но и все, что окружает его, включая общение с поклонниками конкурса. Потому я тоже очень хочу пережить это!". Второй финалист испанского отбора - Salvador Beltrán, написал свою конкурсную песню вместе с Miguel Ángel Arenas 'Capi'. Сальва хочет показать своей "переполненной оптимизма песней" Европе "веселый характер испанцев". "У каждого из нас бывают плохие дни, когда нужно просто думать о хорошем и тех людях, что любят нас". В песне будут ярко выражены испанские фольклорные традиции посредством "традиционной гитары и вокала", а также будет чувствоваться влияние латиноамериканских ритмов. "Я могу описать ее как фанк-латино, с текстом, с которым себя связать сможет каждый слушатель". Сальва Белтран родился в городе Эль-Прат-де-Льобрегат в провинции Барселона в 1992 году. В 13 лет он начал играть на гитаре и фортепиано. Известность к нему пришла в 2012 году, когда продвижением его карьеры стал заниматься популярный исполнитель Алехандро Санз, услышавший музыку Сальвы в интернете. В том же году был издан дебютный альбом исполнителя Cambio de planes, за который он получил премию Прорыв года на Premio Cadena Dial. В апреле этого года вышел второй альбом артиста Reflejos de mi camino, на который вошли песни, написанные самим артистом, в стилях рок, рэгги, боссанова и фанк. Также он исполнил на нем дуэты с другими испанскими артистами. "В последние годы Испанию на Евровидении представляли очень уважаемые артисты, поднявшие популярность конкурса в стране на новый уровень. Я считаю, что у меня достойная для этого конкурса песня, я очень хочу выступить на нем и поделиться со слушателями частичкой своей души", говорит Белтран. Третий финалист испанского отбора - Maverick, который исполнит песню, написанную Juan Magán, Darlyn Cuevas "DCS" и Luiggi Giussepe Olivares. Маверик Лопес родился в Винаросе, Кастельон в 1996 году. С раннего возраста он пел и танцевал на школьных фестивалях. В возрасте 5 лет он принял участие в программе Veo Veo Терезы Рабаль, а в 13 лет решил посвятить свое будущее музыке. Он поет в различных стилях и обладает весьма внушительным вокальным диапазоном - от баса до фальцета. Когда Маверику было 19 лет, он стал финалистом шоу "La Voz". После выпуска дебютного сингла "Princessa descalza", он выпустил свой дебютный альбом. В него вошли как новые песни, одну из которых написала его наставница в Голосе Лаура Паузини, а другие - сам исполнитель, также и лучшие песни проекта Голос. В альбоме "18+1" можно найти как поп-музыку и баллады, так и r'n'b и фанк, черную и латино музыку. "Своей песней я хочу заставить всех слушателей подняться с мест и начать танцевать в такт музыке", говорит Маверик, объясняя, что его песня скорее традиционное латино, нежели электро-латино, которое прославило Хуана Магана. Уже много лет Испания не выставляла на Евровидение латино-песни, и Маверик настроен вернуть этот стиль на конкурс. "Для нас он всегда приносит хороший результат, это наши корни, и для Европы Испания всегда ассоциируется с этим стилем". Естественно, что для своей песни он хочет подобрать и соответствующий номер. María Isabel примет участие в финале испанского отбора с песней, которую написал David Santisteban. Певица описывает ее как "танцевальную, свежую, которая должна понравиться слушателям, и которая лучше всего подходит мне самой". Мария Исабель Лопес Родригес родилась в Уэльве в 1995 году. Слава к ней пришла в возрасте 9 лет, когда с треком "Antes muerta que sencilla", она одержала победу на Детском Евровидении 2004, и возглавила национальные чарты. Эта песня вошла в ее дебютный альбом No me toques las palmas que me conozco, за которым последовали Número 2 (2005), Capricornio (2006), Ángeles SA (2007), и Los Lunnis con María Isabel (2009). Благодаря успешным релизам Мария Исабель выступала в США и Японии, а также во многих странах Европы. После того, как в качестве гостьи, она приняла участие в Детском Евровидении 2010, Мария Исабель практически исчезла из вида, вернувшись пять лет спустя с новым альбомом Yo decido. Певица уверяет, что с годами практически не изменилась: "Мой голос по прежнему узнаваем, и во мне сохранилась та же детскость, я все еще маленькая девочка, испытывающая тоже самое желание жить музыкой, как и когда мне было 9 лет. Это моя мечта, и я никогда не устану бороться за нее, потому что для меня - это самое главное в жизни". Electric Nana представит песню собственного сочинения, которую она описывает как инди-поп композицию, нацеленную на то, чтобы "соединять людей, заставить их улыбаться и помочь хорошо провести время". Electric Nana (настоящее имя Моника Васкес) родилась в Мадриде в 1987 году. Она начала писать песни и играть на фортепиано в возрасте 14 лет. Она сочиняет, аранжирует и продюсирует собственные треки, создавая свежую и оригинальную музыку. Она способна писать музыку в любых стилях и тексты на трех языках - английском, испанском и французском. Она обладает дипломом в области журналистики и в совершенстве владеет иностранными языками, описывая свои музыкальные истоки, как прежде всего англо-саксонские. Впервые под именем Electric Nana она выступила в 2007 году. Четыре года спустя, в 2011 году, с участием в проекте Plan B Карлоса Хеана к ней пришла известность. С ним она записала треки "Lead The Way" и "Gimme the base", которые возглавили чарты iTunes. Также она писала песни для саундтреков, сочиняла музыку для других артистов, таких как DJ Nano, Why Five, Baby Check Check. В апреле 2015 года певица выпустила свой дебютный альбом "To Life! ", в который вошли 12 песен на английском языке в стилях поп, рок, фолк и электронная музыка. "Сколько я помню себя, я никогда не пропускала по телевизору ни одного года Евровидения, и всегда говорила, что хотела бы выступить на этом конкурсе. Не понимаю, почему иногда музыканты боятся принять в нем участие. Сейчас я очень рада этому шансу, и мне кажется, что у меня есть правильная песня для этого. Я участвую в отборе не для раскрутки, я действительно хочу попасть на Евровидение. Для меня этот конкурс - свет, музыка, апплодисменты, танцы, невероятные вещи - самая крутая вечеринка во всем мире. Так прекрасно, что несмотря ни на что, каждый год, все страны Европы объединяются посредством музыки. Я мечтаю о том, чтобы ощутить этот праздник на себе", говорит Electric Nana. Певица Barei, выступит с треком авторов Rubén Villanueva и Víctor Púa Vivó, который она описывает как "имеющий электро-поп основу, современное звучатие, влияния американской поп-музыки, соул и черной музыки, песню, с которой соотнести себя сможет каждый, рассказывающей о том, что никогда не надо сдаваться". Барей (настоящее имя Барбара Рейсабаль) родилась в 1982 году. Она - певица и автор песен, уже выпустившая два альбома: Billete para no volver и Throw the dice, чья музыкальная карьера продолжается уже 16 лет. Барей изучала музыкальную теорию, пение, игру на гитаре и фортепиано, приняла участие в Festival de Benidorm, а затем отправилась в Майями, где приступила к написанию собственных песен. После возвращения в Мадрид она выступала на всех крупнейших площадках столицы Испании. В этом году она также приняла участие в фестивале Starlite в Марбелье. Молодая певица пишет песни и поет в основном на английском языке, на ее счету песни для таких артистов, как Malu, Edurne и японская певица May J, а также ряд саундтреков для телевидения. Среди артистов, повлиявших на ее энергичный музыкальный стиль Барей называет Michael Jackson, Stevie Wonder, OneRepublic, Maroon 5, Sia, Pink. Президент: Nicola Caligiore - 37 - глава делегации Италии, менеджер по международным отношениям RAI. Marta Cagnola - 41 - журналист, ведущая, музыкальный эксперт "Radio 24" - "Il Sole 24 Ore"
Eddy Anselmi - 46 - Журналист и эксперт Фестиваля Сан-Ремо и Евровидения. Emanuele Lombardini - 40 - Журналист и блоггер, основатель EurofestivalNews. Cristina Giuntini - 49 - Президент OGAE Italy. Президент: Christer Björkman - 58 - Продюсер Евровидения 2016, SVT Melodifestivalen 2016, глава делегации, исполнитель. Samuel Andersson - 28 - Ассистент продюсера Евровидения 2016. Åsa Paues - 52 - PR менеджер, пресс-атташе Евровидения, еврофан. Президент: Helen Riddell - 38 - Глава делегации Великобритании, BBC. We're never gonna know what lies ahead. Come on and raise your battle cry! You keep on climbing over hills! Right now you're following your dreams! Hurray! Sing it lalalala! Hurray! No need to be afraid! Booh Ah! I got the light between my breaks Booh Ah! wounds upon my hands Booh Ah! to find the way to go back straight. Booh Ah! No no no no won't fix by running! Hurray! You gotta Say Yay! Raise up your battle cry!